Catered Banquet Dinner, Membership Specials, Mega 50/50, Door Prizes & Raffle Baskets to many winners! Join us for a wonderful evening of Fellowship, Celebration and Fun in Sobriety! 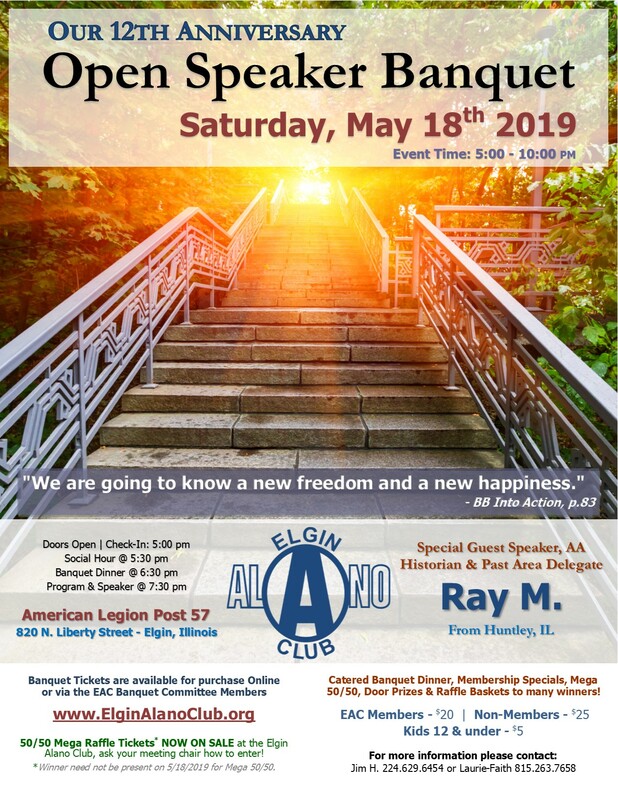 Guests will enjoy a fantastic Dinner Banquet, a chance to enter the 50/50 Raffle and Grand Prize Raffle (Illinois State Conference Admission) – all whilst enjoying our guest speakers, fun awards and club announcements to close off the evening with . Seating is Limited – Learn More – Buy Tickets Online Now! 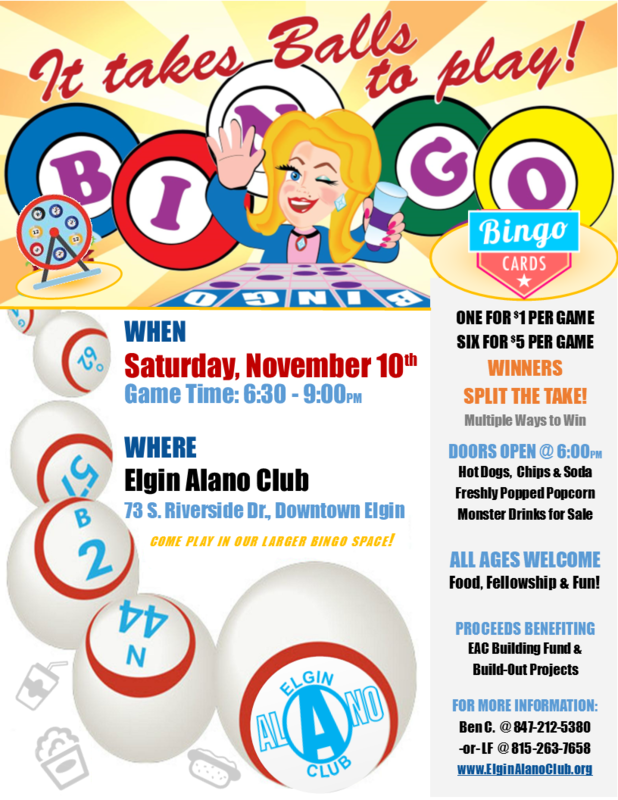 We need YOUR support for our Biggest Fundraiser of the year and to bolster activities at our Downtown Elgin club home ! Have you bought your tickets for the Banquet yet? No, why not? Just a reminder that tickets will NOT be available at the doors, As this is a sit-down banquet dinner, we need to know how many people will be attending in advance. You know, for the number of tables to set the room and how much food to buy. Little things like that. This event is an important part of belonging to this club. We will introduce the board of directors and what’s next for our Building Fund plans at 73 S. Riverside, award the cherished “MEMBER OF THE YEAR” plaque, enjoy our Guacamole & Coffee Social hour. Don’t forget that there will be some exciting raffle prizes, 50/50 cash prize and musical entertainment… all between 5:00 – 10:00 pm. .
You can buy tickets on line at our website or hunt down a member selling them but act fast. You’re support is needed & appreciated, don’t delay – get your tickets today! 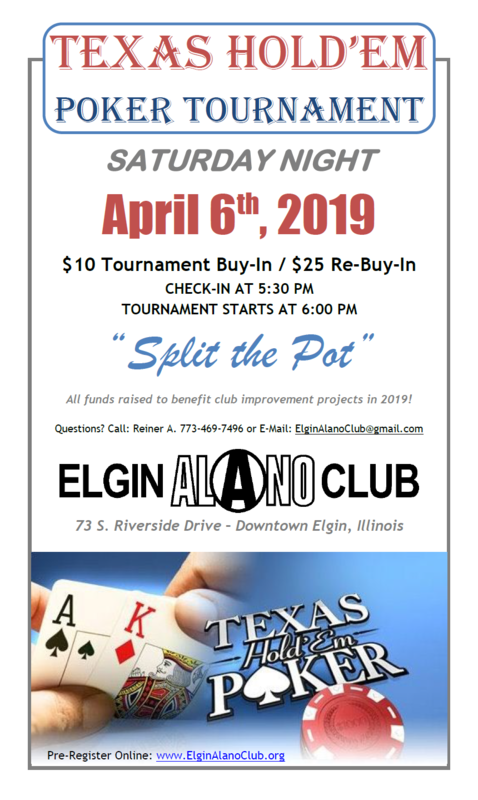 All funds raised to benefit club improvement projects in 2019! 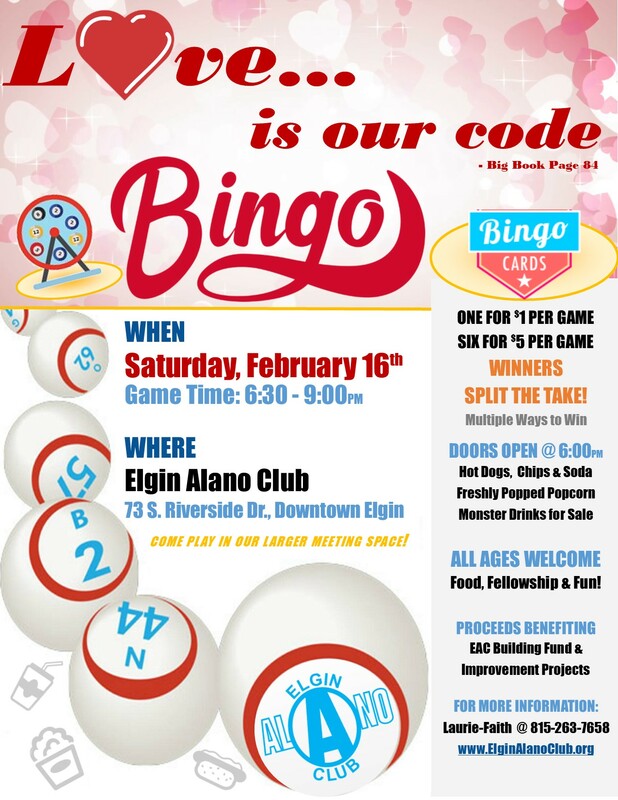 “Love… is our code” BINGO Night – Games. Fun. Prizes! Come Play in our Larger Meeting Space! Hot Dogs, Chips and Soda available – Freshly Popped Popcorn & Monster Drinks for Sale! Multiple Ways to Win per Game! It Takes Balls to Play Bingo Night! “It Takes Balls to Play Bingo” Night – Games. Fun. Prizes! Come Play in our Larger Bingo Space! 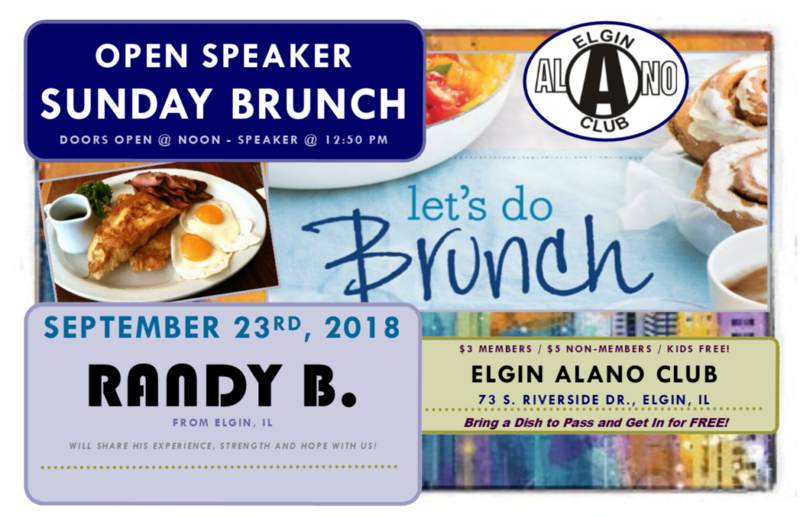 Sunday Open Speaker Brunch – Randy B. Speaker Randy B. from Elgin, Illinois will share his experience, strength and hope with us!